Welcome to the 2019–20 season of the Columbus Indiana Philharmonic! Please call or visit the Philharmonic Box Office to renew your subscription. 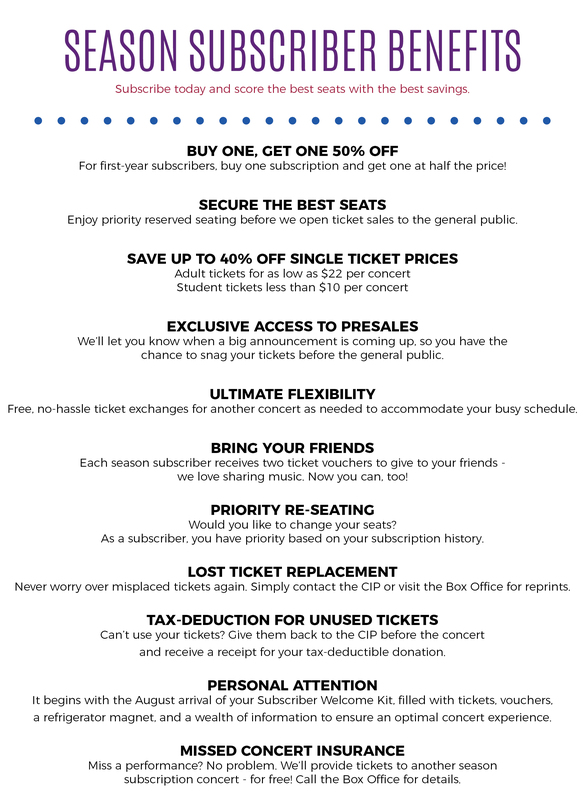 Purchase a subscription and receive special benefits, including exclusive presales, the best seats, and the biggest savings! To renew your season subscription for another memorable season, simply click the button below, call us at 812-376-2638 or complete this renewal form. New subscribers get BOGO 50% Off! Order online or call the Box Office at 812-376-2638 to order your season tickets today! Subscription seats will be assigned by Box Office staff in the order in which they were purchased. We understand your busy schedule. We also understand some seasons it’s not possible for you to attend all 7 events! The Pick-A-Pack option gives you the flexibility you need and the savings you want! Choose 3 or more concerts, and save 10% – complete this form to receive your discount!